That unexpected Children of Men effect keeps on going. In addition to the movie adaptation of PD James' novel being adapted into a TV show that will veer closer to James' original intentions, the writer of the movie Timothy Sexton is keeping it in the SF family with new project Timecrimes. Timecrimes, which has one of the least appealing titles of recent memory (Seriously, what says "Direct to DVD movie starring some faded 90s action hero" more than "Timecrimes"? 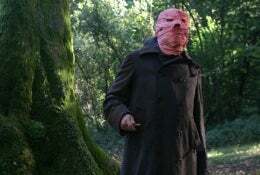 ), is a remake of last year's Spanish movie Los Cronocrimenes from director Nacho Vigalondo. With a plot centering around a man accidentally traveling thirty minutes into the past, meeting his past self and then becoming embroiled in an unlikely and unclear crime, the movie was unsurprisingly a hit at last fall's Sundance Festival before being given a limited release in October last year. This remake is being produced by United Artists, so expect to see Tom Cruise doing his concerned yet firm face in the lead role when it makes it to a cinema near you.